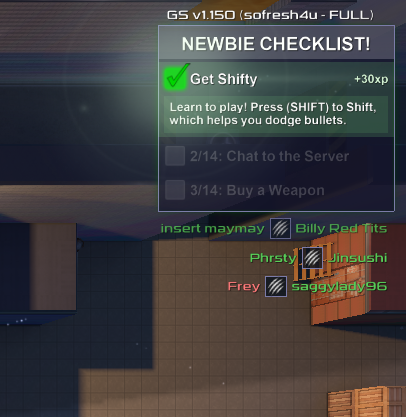 Geneshift Forums • View topic - Version 1.15: Jump Pads, New XP System & 5 Extra Modes! Post subject: Version 1.15: Jump Pads, New XP System & 5 Extra Modes! This version adds a new Quake-inspired feature - jump pads! Simply hop onto a jump pad and it will launch you up into the air. Jump pads come in two main flavours, horizontal and vertical. In the gif above we see horizontal ones chained together. 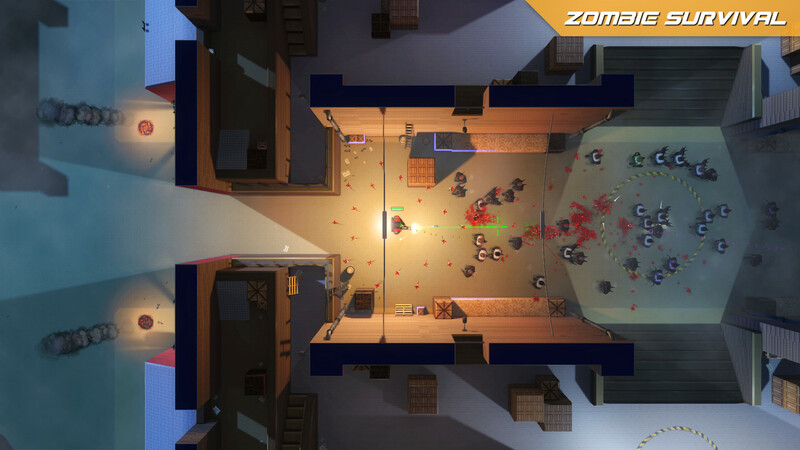 Vertical ones are placed next to buildings and let you easily jump over walls and other obstacles. I added jump pads because I received a lot of feedback that the maps were too maze-like and hard to navigate. Especially in a turbo fast Battle Royale, the last thing you want is to get stuck in a dead-end and killed by the circle. Jump pads solve this issue. I have placed pads in all the dead ends and now it is super easy to get to the centre. So hop into the game and hop onto a jump pad! I have reworked the XP system to give a new sense of progression. As you kill enemies in-game you will now earn XP, which is similar to the old "points" that you earned to unlock items. However this XP now has a second benefit, which is that it permanently increases the amount of skill points you start a round with. This is applied in the campaign and when playing against bots, and is an optional setting in multiplayer games. This provides a bit of an MMO mechanic. When you first create an account you will be at level 1. But as you play you'll slowly and permanently level up. After playing for a few hours you might reach level 6, which means you start each game with 6 skill points instead of 1. 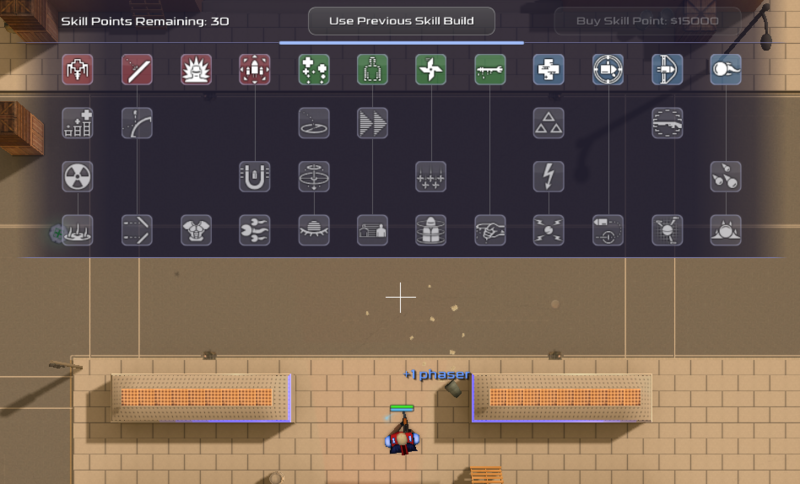 For convenience I've added a "use previous skill build" button, which instantly loads up the previous build you were using with a single click. This new system makes you feel more and more powerful as you play and lets you experiment with some fun skill builds. Before, when you started at level 1, the match ended before you had a chance to get a good skill combo going. Now you can enjoy your favourite skills all game. I have unlocked all 5 additional game modes for base game players (those who don't have the DLC). Previously only DLC owners could play these, but there wasn't much point because there weren't enough players in the servers. Now everyone can play every PvP mode! The new modes are Conquest, Extraction, Checkpoint Racing, Deathmatch and Zombie Survival. Another big concern with the previous version was the lack of a tutorial. Well this has been (partially) addressed by adding the Newbie Checklist to Battle Royale. It's a little box that sits in the top-right corner of the screen and guides you step by step through all the main areas of combat. It takes 5 to 10 minutes to complete and can be done in-game while playing, and will teach you how to buy guns, use skills, place and destroy chemicals, and more. I have slowed zombie movement speed so they're less overwhelming. Neutralizing chemicals now awards a fixed $3000. Tier2 weapons now cost $2000 instead of $3000 and have more ammo. Default round duration is 2.5 minutes instead of 2 minutes. Rearranged a bunch of challenges based on completion rates. Loot now spawns in specific areas, instead of evenly across the map. Enemies don't show on the minimap while falling in BR. The "new item discovered" popup box no longer distracts you in pvp servers. If you win a solo/duo BR round, you get to keep your gun for the next round. Skills are now capped at level 3 instead of level 5. Skill points can be purchased in all game modes now, not just BR. The skill queues system now works in Battle Royale. Drastically sped up the drop rates for discovering new skills and chemicals in-game. End of round awards now contribute towards your item and skill level progression. The bomb that will become the centre of the next round is now highlighted in the minimap. Self Repair skill now increases the rate you gain mana as you level it up. Next version I will be reworking the skills system and adding more depth and strategic territory control to the Battle Royale mode. I'll also continue to chip away at the long list of balance, bugs and other suggestions you guys have provided me. It's great to have a clear list of feedback to work from and I hope you guys enjoy this new version!